Do you need a small bow shackle? We have a great range of the British standard small screw pin bow shackle here at Rope Services Direct with internal bow diameters starting at just 7/8 inch with a 0.5 tonne working load limit. 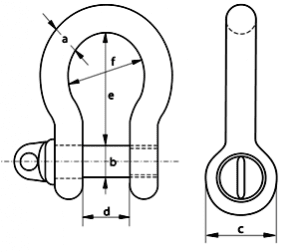 This particular bow shackle has the standard type fitting- the screw pin (type A); these are really quick and easy to fit however it is worth noting that hand tightening the pin may not secure it tight enough and if it encounters any type of friction it could potentially un-screw itself. To ensure the pin is as tight as possible you can use a pair of pliers, grips or even locate a screw driver through the hole in the pin, then simply crank it that little extra to make perfectly tight. By doing this you can minimise any risk of the screw pin loosening and coming out; not something you want to happen whilst it is in use. Supplied in a choice of finishes – self coloured or hot dipped galvanized. The 5:1 safety factor means that the minimum breaking load is actually 5 x the Working load limits stated. EC declarations of conformity can be supplied. We can also supply items from our vast range of fittings to suit this shackle as well as lifting slings. Our range of British standard small screw pin shackles goes up in small steps up to 13 tonne with dimensions to suit. Review the table below, choose your size and give us a call on 01384 78004. 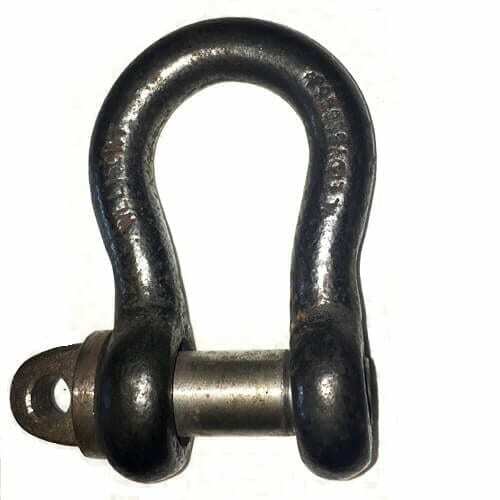 British Standard Small Screw Pin Bow Shackle Overall rating: 5 out of 5 based on 6 reviews.